Food coloring and food dyes have been used throughout history, although until recently, most food coloring was natural and didn't include the artificial food dyes that are commonly used today. For example, saffron is a natural food coloring that has been used to add a yellow color to foods since the early Roman Empire and even before then, in Egypt. 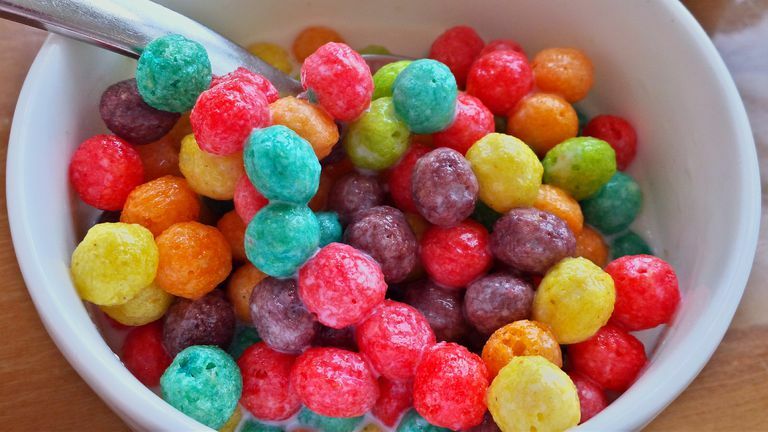 Although we often think about the food coloring in sugary kids' cereals, such as Cocoa Pebbles, Lucky Charms, and Trix, food coloring can also be used to make other foods more appealing. Food coloring is used to make certain foods have a more uniform color, to simulate the color of fruits and vegetables that aren't actually in the food, and in many foods that are targeted at kids to make them more fun looking. Natural food coloring agents are also used in many foods, and in addition to saffron, including beet juice, annatto extract, and caramel color. Is it safe for your kids to eat foods with artificial food coloring in them? The Food & Drug Administration regulates all artificial food colorings and certifies them for use in foods. Although the FDA says that adding food coloring to food is safe, some groups, including the Center for Science in the Public Interest (CSPI), insist that they aren't and want them banned. The idea that artificial food coloring could be a problem for children was popularized in the 1970s by Dr. Ben Feingold and his Feingold Diet. This diet eliminated a number of items from a child's diet, including artificial food coloring, artificial flavoring, aspartame (an artificial sweetener), and artificial preservatives. Although most initial studies discounted the effects of the Feingold Diet any link between food coloring and behavior problems or ADHD, a couple of newer studies from the United Kingdom suggest that maybe they do. One study alternately gave children either a drink with food colorings and preservatives or a placebo drink over a four week period, and parents reported worsening of their children's behavior, even when they were given the placebo drink. The behavior was a little worse with the drink with the food coloring in it, but even more significantly, the testers in the clinic doing the research didn't notice any difference in the behavior of the children, whether they were drinking the food coloring mix or the placebo drink. Another research study from the United Kingdom that was published in the journal Lancet found small increases in hyperactivity in a group of 3-year-olds and another group of 8- to 9-year-olds, but it was both when they drank a mix of artificial food coloring and when given a drink with a food preservative. Do we need food coloring? Without food coloring, many processed foods likely would have a drab or uneven color, which would not always be appetizing. That doesn't mean that we need artificial food coloring though, as more natural food coloring can usually get the job done too. The CSPI reports that many big companies sell different versions of foods in the United Kingdom with natural food colorings, while in the United States, they contain artificial coloring. For example, M&M's, Skittles, Starburst Chews, and the strawberry sauce that McDonald's uses on its sundaes. The strawberry sauce is made with Red 40 in the United States, but in the United Kingdom, they use real strawberries. But even with artificial food coloring in foods, it doesn't have to be in everything your child eats. What does chocolate milk mix look like without Red 40 in it? Does your child's candy really need to leave a tattoo on his tongue? Does everything he eats need to leave a temporary stain in his mouth and around his lips? Do all foods for kids have to be blue, orange, or purple? Apparently not, which may be why Heinz doesn't sell blue and green ketchup anymore. Giving your child more whole foods and avoiding or limiting the amount of processed food he eats. Reading food labels and checking for artificial food coloring agents on the ingredients list, including Blue 1, Blue 2, Green 3, Red 40, Red 3, Yellow 5, and Yellow 6. This might help you find foods that you wouldn't think had artificial food coloring in them, such as pickles, snack chips, macaroni and cheese, yogurt, and breakfast cereal, etc. Looking for foods that use organic or natural food coloring, which is indicated by ingredients such as annatto extract, beta-carotene, beet powder, caramel color, fruit juice, paprika, saffron, turmeric, and vegetable juice. Avoiding or limiting foods with a lot of different bright colors on them, for example, something like Kellogg's Pop-Tarts Frosted Double Berry toaster pastries. These breakfast treats look fun, but if you check the food label, they do have almost all of the artificial food colors in them, including Red 40, Blue 2, Yellow 6, and Blue 1. If you start reading food labels more actively, you might be surprised that artificial food coloring agents have already been replaced by natural food coloring ingredients in many foods. Not surprisingly, snack foods, sugary cereals, and most foods that wouldn't be on any one's list of healthy foods had artificial coloring added to them. Bateman B, Warner JO, Hutchinson E, et al. The effects of a double-blind, placebo-controlled, artificial food colorings and benzoate preservative challenge on hyperactivity in a general population sample of preschool children. Arch Dis Child. 2004;89:506–511. Complementary and alternative medical therapies for attention-deficit/hyperactivity disorder and autism. Weber W - Pediatr Clin North Am - 01-DEC-2007; 54(6): 983-1006. McCann D, Barrett A, Cooper A, et al. Food additives and hyperactive behavior in 3-year-old and 8/9-year-old children in the community: a randomized, double-blinded, placebo-controlled trial. Lancet. 2007:370(9598):1560–1567. U. S. Food and Drug Administration. Food Ingredients and Colors. Updated April 2010.